Norway is ranked at the top in the World Happiness Report 2017 published by the United Nations. It is also known as one of the most advanced countries in terms of gender equality as shown in the top ranking every year in the Global Gender Gap Report published by the World Economic Forum. In contrast, Japan is the 51st in the happiness ranking and the 111th in the gender gap ranking. What does the research reveal about gender equality and family-life-balance in Norway? What are the differences between Norway and Japan? 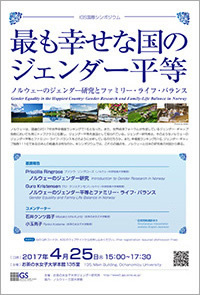 A dialogue between Norwegian and Japanese scholars in this symposium will explore these issues. *Prior registration required ☛We have closed registration form because there is no more seats available.